I had a super A. furcata watching day in my local wildlife garden today. 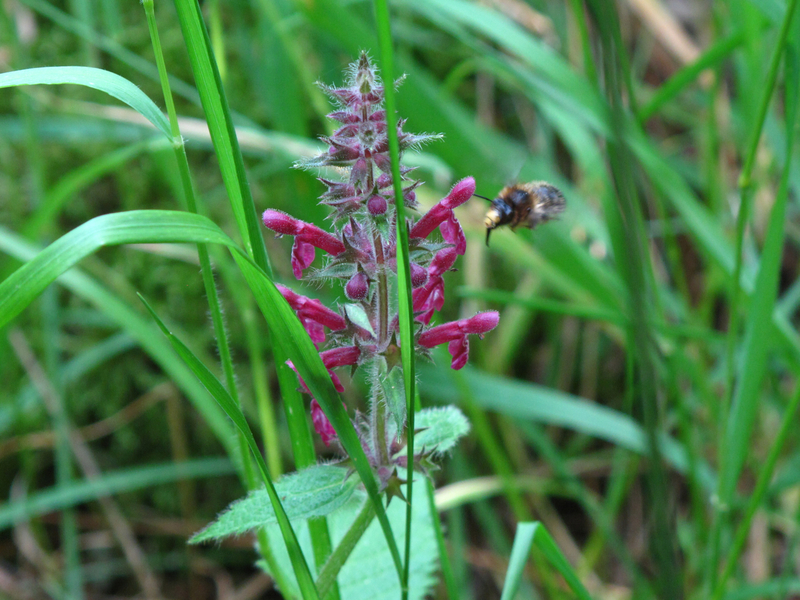 In a beautiful large patch of flowering Hedge Woundwort (Stachys sylvatica), in the shade, a male (below) kept patrolling, checking every flowering spear visually and darting between them, stopping to feed occasionally. Two females collected nectar and pollen, at times both together in the same spear. The male came across and pounced a couple of times on a female, but I saw no copulation. Males seem to have a similar patrolling behaviour around favoured flowers as A. plumipes. In my garden it patrols different flowers around it (Iris, Digitalis lutea and D. purpurea). But last year I planted their local native favourite plant, S. sylvatica in a shady corner. Although it is still small, it is now flowering. Something interesting is that these bees do not mind shade or cloudy weather, they will be out and about like bumblebees whatever the weather, so they don't tend to overlap with sun-loving Anthidium manicatum - which has a similar flower choice than them and males aggressively defend territories - so much when they forage. I wonder if they are able to thermoregulate in a similar way than their relative A. plumipes and this allows them to exploit a different niche to other summer bees. An Anthophora furcata female with legs full of pollen foraging in Stachys sylvatica. I've been getting A. furcata in my garden for the last few years. I just added a few new plants to the garden including Stachys lanata (I got the variety name of your Anthidium post!) 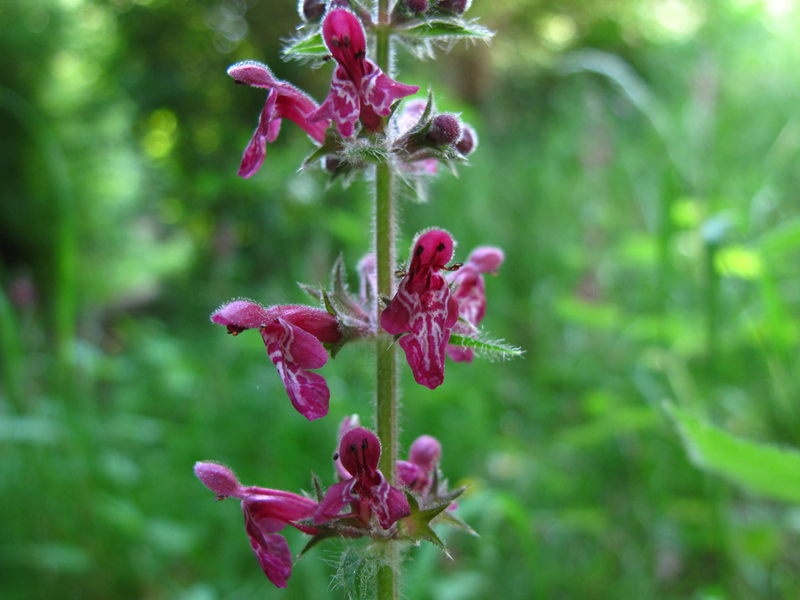 but it'd be interesting to try the native Stachys for A. furcata. Hopefully I may start getting Antidium too (I'm sure I spotted a male whizzing straight through last year). It's great to have such diversity of bees at one's reach in the garden. I think Anthidium manicatum would get hairs from any hairy plant, but Stachys lanata or byzantina (I am not sure if they are two separate species) have both plentiful hairs and the flowers they like. 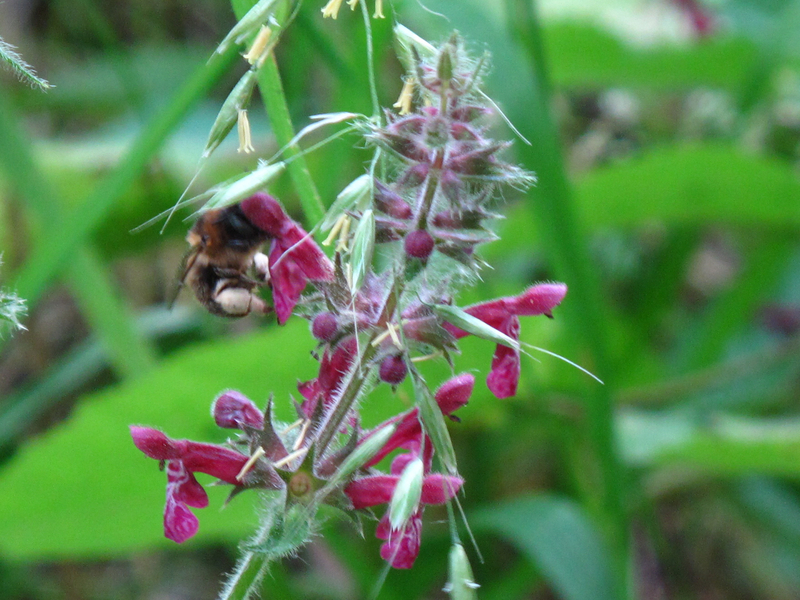 I was a bit surprised to find out in the National Biodiversity Gateway that Anthidium manicatum had not been recorded in East Yorkshire and it is quite rare this north, so I have submitted my records to BWARS. Yes I was thinking the same thing - my Stachys was labelled: Stachys lanata 'byzantina' ! It's important to realize initially the BWARS NBN data was a test dataset (technically it probably still is). I beleive it's more complete now but due to the nature of recording it'll be at least a year out of date. A. manicatum has certainly been recorded in Yorkshire, but I'm not sure about the east. If you want a Yorkshire species list I could probably get one for you. If so contact me off-board (use my contact page). I was just across the Humber from you last week at Far Ings, Barton looking for B. hypnorum this side of the river. No luck though. I have recorded it in Grimsby and Lincoln in recent weeks though.